L'eau en Amérique du Nord : facteur de coopération, outil de développement ou enjeu de conflit ? 1Water management at the river basin level has been in the Mexican national agenda for the last 60 years. Initially, the overall objective was to encourage water-based socio-economic development and poverty alleviation in specific river basins of the country. With time, the changing economic and development-related needs at the national level forced a different approach. The objective of encouraging river basin management was no longer achievement of socio-economic development, but basically to improve water management practices and to meet the increasing demand for water supply for medium- and large-size cities. 2The role and importance of the river-basin institutions over the time have been determined by the political and socio-economic conditions of the country. The achievements and constraints of the river basin commissions, and later of the river basin councils did not necessarily depend on their own planning and management practices, but mostly on the programmes and plans of the institutions at the federal level on which they were dependent. 3This paper analyses the different institutional arrangements at the river basin level that have existed in Mexico for the last six decades, including their performance, evolution and challenges. It also tries to explain why, in spite of decades of interest in managing water resources at the river basin level, the achievements of the several institutions that have been established thus far have been limited in terms of development first, and rational and efficient management of water resources later on. 4For a detailed analysis of the Papaloapan, Tepalcatepec/Balsas, Fuerte and Grijalva Commissions, see Tortajada and Contreras-Moreno (2005). For a review on the Lerma-Chapala-Santiago Study Commission, see Wester et al. (2001). 5At the end of the decade of the 1940s, Mexico embarked on large-scale water-based integrated development programmes for the arid plains of the north, and, mainly, for the tropical areas in the east and southeast of the country. Specific river basins were selected where natural resources were plentiful, especially water, but where the population lived in extreme poverty, with acute health problems and with inadequate social and support services in the health, education, communication and transportation sectors. The overall objective of the integrated development programmes was to promote industrial, agricultural and forestry development, through which specific economic and social sectors would benefit from the natural resources available in the different river basins. 6When the commissions were first established, they had full support from the Mexican President, and hence they were practically autonomous with almost no budgetary limitations. However, this situation changed with time, since the following administrations had their own views as to what should be the role, if any, of the river basin commissions within the overall economic development strategy of the country. 7In 1947, the Ministry of Water Resources was established with the full support of the then President. One of the main tasks of this Ministry was to coordinate the activities that would be carried out in the several river basins by the executing and planning agencies (SRH 1952). The executing agencies included the Papaloapan and the Tepalcatepec River Basin Commissions (established in 1947), the Fuerte River Basin Commission (established in 1951), and the Grijalva River Basin Commission (established in 1952). 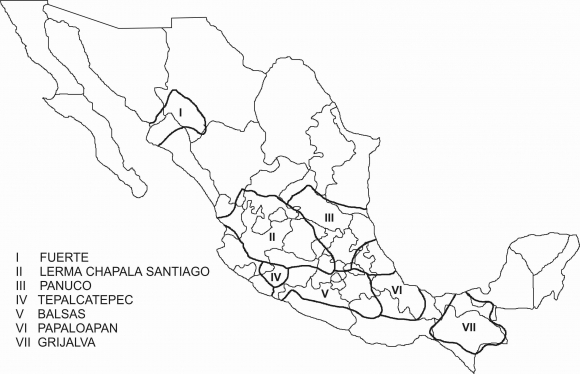 In order to include larger areas within the integrated development programmes, the Tepalcatepec Commission was wound up in 1960 and the Balsas River Basin Commission, which covered a much larger area, was created the same year. Planning agencies included the Lerma-Chapala-Santiago and the Panuco Commissions (see Figure 1). 8Several ministries collaborated in the development of the river basins, always under the leadership of the Ministry of Water Resources. These were the Ministry of the Interior, Ministry of Finance and Public Credit, Naval Ministry, Ministry of Economic Issues, Ministry of Agriculture and Livestock, Ministry of Communications and Public Works, Ministry of Health, and Ministry of National Properties and Administrative Control. The main tasks of the river basin commissions included, but were not limited to, planning, design, coordination and construction of irrigation projects, flood control programmes and hydropower generation. The commissions were also responsible for expenditures on urban and rural developments, health and communication services. 9When the river basin commissions were created, the then existing policies emphasized the importance of the integrated social and economic development of the regions based on the natural resources available, water being the main resource. Hence, the river basin commissions had full authority to plan and execute programmes for integrated development under their direct supervision. They were also responsible for coordinating the activities of the several ministries within the river basin, for which they had limited authority but on which they were able to make inputs. Because the river basins included more than one state, the commissions were more powerful than the states and municipalities. Thus, even though the river basin commissions had the authority to plan and implement the different tasks in coordination with the specific ministries, the fact that the commissions were above the states created tensions among the institutions over the years. 10During the years the commissions acted as executing agencies, they made determined attempts to use water as a part of the national effort to develop the several basins and regions. However, while the activities carried out by the river basin commissions had beneficial impacts on the overall development of the country, their programmes and projects did not achieve their objectives at the regional levels. This is because increase in irrigated area would not necessarily increase agricultural production, and thus improve the quality of life of the local populations. Investment in social issues, and provision of credit and technical assistance, are equally important factors to ensure the long-term success of any agricultural development project (Barkin and King 1986). 11It is important to note that the performance of the different river basin commissions varied according to the socio-economic and political conditions of the country at specific times. These conditions depended, and still depend, on each six-year presidential mandates, and hence, on the priorities and budgetary allocations of each administration. For example, in 1947, the central government considered that the water resources in several geographical areas could act as “engines” for development of the poorest regions of the country. Accordingly, it provided very significant financial support to the Ministry of Water Resources for the implementation of the projects. However, the subsequent administrations had different approaches, which were reflected in the activities authorized and the budgets allocated. Hence, the achievements of the commissions were not always of their own making, since they depended mostly on the decisions at the federal level on which they had limited or no control. 12When the river basin commissions were established, the economic policies of the country focused primarily upon large-scale agricultural and industrial development projects. Numerous large projects were constructed for different purposes, the most important of which were for irrigation and hydropower generation. The investment in irrigated agriculture was extensive. In fact, from 1947 to 1967, irrigation was introduced to more than 1.2 million ha. The expectation was that expansion of irrigated agriculture would bring agro-industrial development, increase exports, and generate new employment opportunities. 13However, the river basin commissions were not isolated from the conditions at the national level. While during the 1946-1952 presidential term, the national policies were to invest heavily in the different regions, more with economic than social objectives, the next administration (1952-1958) faced high inflation rates and currency devaluations. Consequently, the total budgets of the different ministries, including the river basin commissions, were reduced in real terms. The number of projects which the river basin commissions implemented became fewer. In addition, since the political perception was that the commissions clashed with the other ministries and with the state governments, their power and authority were steadily reduced. For example, the Tepalcatepec Commission found itself in the unfortunate position of having no funds for the construction of new development projects, and the Fuerte Commission lost its initial mandate (Orive 1970). The 1952-1958 administration achieved higher agricultural outputs, but with high levels of rural under-employment. 14From 1964, the water policies of the country emphasized not so much the construction of water projects, but the improvement and development of small irrigation projects primarily because the objective was to increase the social benefits. In addition, the concept of integrated development of basins was changed to integrated regional development, which included several basins. For water resources planning, several regions were established and water plans were formulated for the northwest, central and central-gulf regions. A National Plan for Drinking Water was prepared to ensure future availability of water supply for the Mexico City Metropolitan Area (SARH 1988). 15In 1972, a new water law was enacted, and a commission was established to develop a national water plan, with national and regional objectives. In 1975, the National Water Plan was finalised, and in 1976, the National Water Planning Commission was established to implement it, and to update it on a regular basis (CNA 1995). The 1975 Water Master Plan stated that the management of water resources would be carried out at the regional level based on the hydrology of the country. The plan also proposed the establishment of water institutions at the regional level, which would include the major river basins. These institutions would have decision-making power and would have the authority to formulate the regional water development plans, prepare and implement actual projects, and decide on the fees and collect them for water users and effluent discharges. The central authority was to be responsible for the policy formulation at the national level, coordination among the different sectors, resolution of conflicts among the regions, integration of regional plans into a national planning framework, implementation of large-scale and technically complex projects, and management of research and training programmes (SRH 1975). 16According to the 1975 Water Master Plan, 13 hydrological regions were established, and regional programmes as well as water development programmes were developed for each one of the regions, with the objective of using more efficiently land and water resources available, and to reduce the prevailing inequalities in water availability to the people. The water development programmes included large-scale irrigation, flood control and drainage for agriculture; water supply for major urban and industrial areas, and multi-purpose hydropower projects (Herrera-Toledo 1997). 17In 1976, due to the importance of irrigation at the national level, the Ministry of Agriculture and Livestock, and the Ministry of Water Resources, became the Ministry of Agriculture and Water Resources. The previous Ministry of Water Resources became one of the five componentes of the newly created Ministry. 18This new institutional arrangement, under which water planning, management and development activities were placed under different ministries, made coordination and execution of any water policy very difficult. This complicated the implementation of the 1975 Water Master Plan, as well as the performance of the National Water Planning Commission. Some of the main achievements of the Commission were the formulation of the overall national water policies in collaboration with the agricultural sector, formulation of the 1981 National Water Plan which emphasized regional aspects more than the previous 1975 version, preparation of the water plans for the states, and the basis for the water-related programmes for the 1976-1982 and 1982-1988 National Development Plans (CNA 1995). 19By 1982, water scarcity and water pollution had become serious problems at the national level. The new administration (1982-1988) prepared a new water policy by considering these constraints. Among the other problems it addressed were flood control, conflicts between water uses and users, and low efficiency of water use in all the sectors. While the need for construction of infrastructure was acknowledged, the main objectives were appropriate use of water, maintenance of all types of infrastructure, water pollution abatement through better administration of water resources, improved social and economic efficiency, technological improvements, and human resources development. 20In an effort to decentralize, the Ministry of Agriculture and Water Resources delegated activities to its offices in the states and established regional coordinating agencies to improve the integrated management of water at the river basin level. Since the new water policy emphasized the management of water resources at the regional level, it was decided that the offices of the Ministry in the states would take over the responsibilities of the river basin commissions, including further planning, management and development of water resources, and that the river basin commissions should disappear (SARH 1988). It was decided that “plans for the use of water resources, developed by the authorities at the municipal, state and federal levels, will be based on the hydrologic basin, but taking into consideration the development trends in each region.” (PRI/IEPES 1982, p. 152). 21In 1989, it was decided again that the responsibility for overall planning, management and development of water resources in the country would be under one institution, the National Water Commission (CNA by its acronym in Spanish). Initially, the CNA was under the Ministry of Agriculture and Water Resources. In 1994, it was moved to the Ministry of Environment, Natural Resources and Fisheries (SEMARNAP), which became the Ministry of Environment and Natural Resources from 2000 (SEMARNAT). 22The idea of managing water at the river basin level reappeared later, and continues until the present day. In 1992, a new Law on National Waters was enacted (DOF, 1992). Article 8 of this law states that the river basin councils would be established, and that their role would be as coordinating agencies to mediate between the CNA, the federal, state and municipal bodies, as well as the representatives of the users from the specific river basin, with the objective of developing and implementing programmes and activities to improve water management, develop water infrastructure and related services, and protect the natural resources of the basins. The structure and organisation of the river basin councils were defined in the Regulations, Art. 15 (DOF, 1999). “following a decision by its Technical Council, the Commission (CNA) shall establish basin councils to coordinate and liase with the Commission, federal, state and municipal departments and agencies; and representatives of users of the hydrological basin in question, with a view to formulating and implementing programs and actions to improve water administration, development of water infrastructure and the respective services, and the preservation of basin resources. Within the scope of the basin councils, the Commission shall agree with the users on any temporary limitations to existing rights in the event of emergencies, extreme scarcity, over-exploitation or declaration of protected areas. In such circumstances, residential use shall have priority.” (Anon., 1997). 25Establishing functional management units at the river basin level has proved to be a very complex task. River basin councils are expected to manage water from integrated and regional perspectives, and involve water authorities at the federal, state and municipal levels, as well as the various users. However, it seems that the institutional arrangements established from 1992 have not had perceptible impacts in terms of improving water management practices (Marañón, 2004). 26The country has been divided into regions and sub-regions for water management purposes. There are 13 regions, based on the hydrology of the country, and 102 sub-regions on the basis of political jurisdictions. Each sub-region includes a number of municipalities of the same state, so that regional programmes can be planned at the sub-regional level. At present, there are 314 hydrological basins, 37 hydrological regions and 13 administrative basins. Twenty-five river basin councils, out of the 26 that were planned, have already been established, but the vast majority are not yet functional for all practical purposes (Table 1). 27Vast majority of the river basin councils at present are not operational: they are still in the process of organisation. The councils continue to be coordinating units that can only make recommendations to the authorities and to the users. Even though the Law of National Water (1992 and 2004) stipulates that the river basin councils can develop and implement programmes for the construction of water infrastructure which could be considered to be strategic, the fact remains that because the councils have not yet been functional, not all have a say in the planning, design or operation of major water infrastructure of the country. If and when they become fully operational, it is yet to be seen as to whether the central authorities will allow the councils to use their decision-making powers on important issues, or if the traditional centralised decision-making in the country will continue for more years to come. 28By law, the basin councils are primarily coordinating agencies whose main role is to make recommendations to the federal government and the users on specific issues. Unfortunately, however, their establishment responds more to broader decentralization trends at the national level which still have not been achieved, rather than from the realization that water can be managed more efficiently from a regional perspective. The main problem of river basin management is not that the councils are not entitled to develop any regulations or execute any administrative or legal action, but rather that the overall operational framework to manage water resources at the basin level is still not functional in the country. If the councils are to become operational, they could play an important role as coordinating bodies. It is still not clear what are to be the operational functions of the councils, or how the councils will relate to the administrative structures of the country at the state and municipal government levels, so that they could complement, co-ordinate and support each other. At present, only one out of the 25 river basin councils that have been created is operational. In most cases, other councils do not even have staff or offices, not to mention implementable plans, financial support, or management and technical capacities (Guerrero and García-León 2003). Table 1. Basin councils established as of November 2003. Source: CNA, 2004, Statistics on Water in Mexico, Mexico. 29After more than 70 years of continuous hierarchical and top-down water management and planning practices, experiences show that the country still lacks the ability to take advantage of the local knowledge and expertise in order to structure the institutional arrangements for water management at the river basin level from a decision-making viewpoint. Real participation by stakeholders has been mostly missing. Among many other constraints faced by the river basin councils are their lack of experience (both technical and managerial) as to the processes by which water policies could be formulated; reluctance of the central authorities to disseminate reliable data and information, lack of appreciation by the authorities on the importance of stakeholders’ participation, and the absence of use of proper economic instruments like water pricing and demand management, and appreciation of the importance of social and environmental issues (CTMMA 2003). The main institutional challenge for the future is how best to transform the basin councils, which in practice are advisory agencies with very little real authority, into basin councils that govern, plan, organize, run, control and supervise water management at the river basin level. 30The foregoing analyses show the relevance, appropriateness and impacts of the efforts made in Mexico in structuring and restructuring its water management institutions at the river basin and regional levels. The results, unfortunately, show that there are still enormous challenges to face not only in terms of institutions, but in terms of the appropriate policies that would provide essential inputs to these institutions so that they are able to perform from an integrated perspective and with a future-oriented approach. 31In the case of the river basin commissions, the overall objective was to promote economic and social growths of the appropriate regions, which were expected to reduce the prevailing inequalities among and within the regions. This was expected to be achieved through infrastructural development and settlement programmes, which, in turn, were supposed to trigger agricultural development, hydropower generation, industrial investment, employment generation and higher incomes for the local populations. 32The establishment of the river basin commissions was a national effort to use water to develop the regions. However, while the programmes implemented by the commissions may have had some beneficial impacts on the overall development of the country, they are no signs at present that they managed to reduce regional inequalities and alleviate poverty. Decision-makers did not appreciate the fact that increase in irrigated area per se was not a sufficient condition to alleviate poverty and improve the quality of life of the local people. Important issues, like investments in social services, provision of credit, technical assistance, participation of stakeholders and capacity building, were not adequately considered, even though they are absolutely essential to ensure the long-term success of any development project. 33In terms of the performance of the existing institutions for river basin management so far, it has to be concluded that they still have a long way to go in order to achieve efficient management of water resources at the basin level. So far, they have had minor impacts in improving water management practices, which means that fundamental institutional realignments are necessary if the present basin councils are to become successful organizations to manage water from a regional perspective. 34Regrettably, no comprehensive and objective evaluations have been made by the authorities concerned on the viability of such institutions, the extent to which they have fulfilled their objectives and their overall societal impacts, both positive and negative. Absence of such objective assessments has meant that appropriate lessons have not been learnt from their failures, and/or sub-optimal performance. This, unfortunately, is a constraint that has existed for many years. For example, globally, the Papaloapan Commission was one of the first programmes of integrated river basin management, and also one of the very first development programmes which focused specifically on the tropics. However, irrespective of the overall investments that were made by the Papaloapan Commission, there was no real evaluation of its overall achievements and the lessons that could be learnt from such a development activity. Official reports focused mainly on the descriptions of the implemented projects, but there was hardly any serious assessment of the experiences resulting from the several development plans carried out by the Commission, which would have been very valuable for future similar integrated development programs, both within and outside the country. 35While the demands for water for various uses have increased significantly in Mexico in recent decades, management practices have improved only slowly and incrementally. Consequently, the water problems of the country, in terms of quantity, quality and management, have become more serious and complex than ever before in history. The demands from different uses and users are increasing rapidly, but the technical and managerial expertise and financial resources of the concerned institutions are growing only incrementally. Unless these trends are reversed, the water situation of the country is unlikely to get better in the foreseeable future. Not surprisingly, OECD (2004) has concluded that “water use in Mexico is on an unsustainable path.” Furthermore, in spite of the efforts at decentralisation, the real authority to plan and manage water resources continues to be vested in one single institution at the central level, which has been unable thus far to respond successfully and sensitively to the escalating needs of the sector and of the different regions of the country. Nor has it been willing to decentralise appropriate decision-making powers, investments funds and technical and managerial resources. 36The needs of the country are surpassing the current institutional capacities. This makes modernisation of the water sector of Mexico an essential task, not only in terms of institutions and laws, but also in terms of overall management practices. The water problems of the country have deteriorated due to the inadequate management practices, technical capacity, and the slow, and often inappropriate, responses of the sole central institution responsible for water management in the country. 37Fortunately, however, the country as a whole is changing. The regions are asking for greater roles in planning, managing and decision-making not only in the area of water, but also in other sectors as well. There are some positive and encouraging indicators that some states are making good and commendable progress in planning and managing their water resources. States are realizing that water is an important resource, and its timely and proper development and management would affect the lives of the people, and their quality of life, through various pathways. While there has been much discussion about decentralisation in recent years, in practice water management has continued to be hierarchical and top-down. Unless real decentralization takes place, where institutions at regional, state and local levels would have the requisite authority, funds, management capacity, and technical expertise, efficient and equitable water development and management, which could improve the social, economic and environmental conditions of the country as a whole within a reasonable timeframe, is likely to remain a distant dream. Anon (1997) Law of National Waters and its Regulations, Law of the Sea, Delma, 4th edn, Mexico City, Mexico. Barkin, D., and T. King (1986) Economic regional development. Approach by river basins in Mexico. Siglo XXI editors, 5th edition, Mexico. CNA (2004) Statistics of water in Mexico. National Water Commission, Mexico. CNA (1999) Law of National Waters and Regulations. National Water Commission of Mexico, Mexico. CNA (1995) National water planning in Mexico. Experiences, results and perspectives. Ministry of Water Resources and Irrigation, Mexico. Guerrero, V., and F. García-León (2003) Proposal for the decentralization of water management in Mexico by means of basin councils. In: Water Policies and Institutions in Latin America, Tortajada C, Braga BPF, García LE and Biswas AK (eds) Water Resources Management Series. Oxford University Press, Delhi, pp 144-159. Herrera-Toledo C (1997) National water master planning in Mexico. In: National Water Master Plans for Developing Countries, Biswas AK, Herrera-Toledo C, Garduño-Velasco H and Tortajada-Quiroz C (eds) Water Resources Management Series. Oxford University Press, Delhi, pp 6-53. Marañón B (2004) Social participation in the management of groundwater: rhetoric and reality. In: Towards an integral management of water resources in Mexico: challenges and alternatives, Tortajada C, Guerrero V and Sandoval R (eds). Porrua, Mexico, pp 231-256. OECD (2004) OECD Economic Surveys. Mexico, 2002-2003. Organisation for Economic Co-operation and Development, Paris. Orive A (1970) The irrigation in Mexico. Grijalbo, Mexico. PRI/IEPES (1982) Working groups for the development of the government plan 1982-1988 on water issues, preliminary document. Institute for Political, Economic and Social Studies, Mexico. SARH (1988) Water and society. Ministry of Agriculture and Water Resources, Mexico. SRH (1952) Report of activities 1 September 1951 to 31 August 1952. Ministry of Water Resources, Mexico. Tortajada, C., and N. Contreras-Moreno (2005) Institutions for Water Management in Mexico. In: Water Institutions: Policies, Performance and Prospects, C. Gopalakrishnan, C. Tortajada and A.K. Biswas (eds). Springer-Verlag, Berlin, pp 99-127. Wester P, R Melville and S Ramos-Osorio (2001) International arrangements for water management in the Lerma-Chapala basin. In: Hansen A and van Afferden M (eds) The Lerma-Chapala watershed: evaluation and management. Kluwer Academic/Plenum Publishers, New York, pp 343-369.